← Lori Copeland. The One Who Waits for Me. Eugene, OR: Harvest House Publishers, 2011. Paul Clayton. 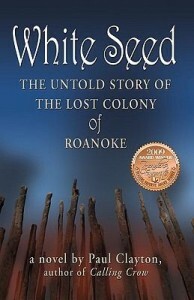 White Seed: The Untold Story of the Lost Colony of Roanoke. [Bangor, ME]: Booklocker.com, 2009. White Seed follows the journey of the settlers of the Lost Colony, the third group sent to the Americas by Sir Walter Raleigh, as they fight to survive on what is now the North Carolina coast. But who would be daring, or desperate, enough to abandon his or her homeland, England, for the wilds of the Virginia Colony? Maggie Hagger, a simple Irish girl running from a terrible deed, seeks indentured passage as a means of escape from the faceless man who pursues her. Accepted as a maidservant for Governor John White’s pregnant daughter Eleanor Dare, Maggie has no idea that she may be trading one death sentence for another. Thomas and Lionel, her erstwhile companions, flee from similarly unsavory fates in England, while others, like the greedy Portuguese captain Simon Fernandes, seek only the opportunity to take what fortune they can from the Natives or fat Spanish ships. As for Governor White, he plans to live out his days peacefully in the tranquil Chesapeake, where the Natives are friendly and the land is mild. But all these hopes are dashed when they are put ashore in Roanoke. There, a bellicose chieftain, Powhatan, has already determined that he will capture and kill any English who return to his land. He is especially reliant on Towaye, the spy he instructed to be captured before the last English returned to their native land. Now Towaye is back with these new settlers, although he finds himself under the watchful eye of Manteo, a Native loyal to the English who raised him from a child in this interpretation of the tale. But Powhatan isn’t the settlers’ only problem. When John White returns to England for supplies, conditions begin to deteriorate, and soon Maggie, Thomas, Manteo, and others find themselves fighting not one, but two enemies: the angry Natives…and their own soldiers. Readers will enjoy this fast-paced, epic account of the Lost Colony’s still-unknown fate, and will find the author’s artistic choices to be interesting deviations from accepted research and other fictional versions. 2 Responses to Paul Clayton. 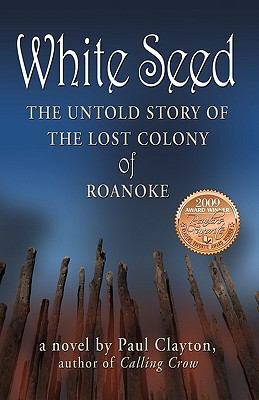 White Seed: The Untold Story of the Lost Colony of Roanoke. [Bangor, ME]: Booklocker.com, 2009. Just a short note to say that my book, White Seed, is now available through CreateSpace at a lower price than the Booklocker version. It is also available in ebook form. Thanks again for including me on your fine book site and for the wonderful review! I find the story of Roanoke fascinating! Sounds like a great read.